Huge Savings Item! Save 19% on the New! 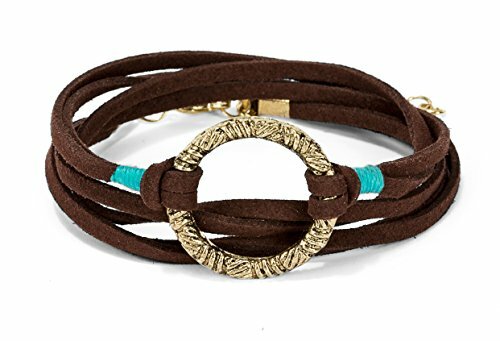 Handmade 3 Wrap Antique Gold Circle Brown Suede with Teal Accent Leather Bracelet with Adjustment Chain | SPUNKYsoul Collection by SPUNKYsoul at The Bling Tree. MPN: 43216-60312. Hurry! Limited time offer. Offer valid only while supplies last. THE CIRCLE IS A DEEPLY SYMBOLIC SHAPE with so many meanings, including the Circle of life, the infinity of the universe, love, the planets, shapes in nature etc. IT'S GIFT READY! A gift for yourself or makes a great gift for a birthday, holiday, Christmas, graduation, going away party, incentive, changing jobs, brides maids or the beginning of any new journey. Also makes a perfect girlfriend, friendship, sisters, besties or best friend gift, anniversary gifts, valentines day or promise,engagement, lovers, couples, motorcyclists bikers. SAFE TO WEAR: Lead & Nickel Free in compliance with all U.S., State requirements & the CPSIA. SPUNKYsoul 100% HAPPINESS MONEY BACK GUARANTEE: Return to Amazon FREE within 30 days, no questions asked FREE RETURNS. If you have any questions about this product by SPUNKYsoul, contact us by completing and submitting the form below. If you are looking for a specif part number, please include it with your message.